Original Antique Maps and Prints. 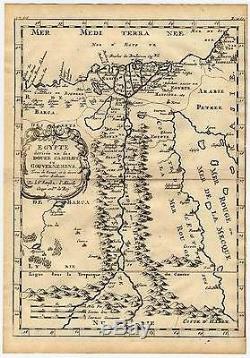 Antique Map-EGYPT-AFRICA-NILE-Nicolas Sanson d'Abbeville-1682. Description: This scarse map originates from:'Curieuse aenmerckingen der bysonderste Oost en West-Indische verwonderens-waerdige dingen; nevens die van China, Africa, en andere gewesten des werelds. De Vries, published in Utrecht by J. This splendid work on the curiosities encountered during the ages of exploration abroad contains 13 maps by Sanson d'Abbeville and many etched plates by Romeyn de Hooghe, which are considered some of the most interesting of his oeuvre. Ref: Sabin, 19854; Tiele, 260; Cat. Carthographer: Nicholas Sanson d'Abbeville (1600 - 1667) and his descendents were important French cartographer's active through the 17th century. Sanson started his career as a historian where, it is said, he turned to cartography as a way to illustrate his historical studies. In the course of his research some of his fine maps came to the attention of King Louis XIII who, admiring the quality of his work, appointed Sanson'Geographe Ordinaire du Roi'. Sanson's corpus of some three hundred maps initiated the golden age of French Cartography. Engraved by Antoine de Winter. Subject: Rare Map:'Egypte divisee en ses Douze Cassilifs ou Gouvernemensï¿½' par N. Sanson d'Abbeville Geographe ordinaire du Roy. Attractive map of Egypt and the Nile Valley showing major cities and political divisions as well as nicely detailed mountains and oases. The map is decorated with a large title cartouche. Condition: Size (in cm): The overall size is ca. The image size is ca. 20 x 27.5 cm. Size (in inch): The overall size is ca. 8.3 x 11.8 inch. 7.9 x 10.8 inch. Medium: Engraving on a verge type hand laid paper, with watermark. ThePrintsCollector Peter Cornelissen, Margo van Latum - van Dongen, Frank van Latum Zeeland - The Netherlands. We guarantee our items to be genuine original. GO TO OUR STORE and explore our huge collection of fine antique maps and prints. FIND SIMILAR ITEMS IN OUR STORE. Visit our Store: we would like to invite you to review similar items in our Store or to browse through all other items in our Store. We are confident that you will find very special unique antique maps and prints in our Store. It is our privilege to have you as a customer. The item "Antique Map-EGYPT-AFRICA-NILE-Nicolas Sanson d'Abbeville-1682" is in sale since Wednesday, November 18, 2015. This item is in the category "Antiques\Maps, Atlases & Globes\Africa Maps".